Throughout 2018 committee members Ian W and Mark H liaised with several local climbing clubs to explore the possibilities of joint club ventures. 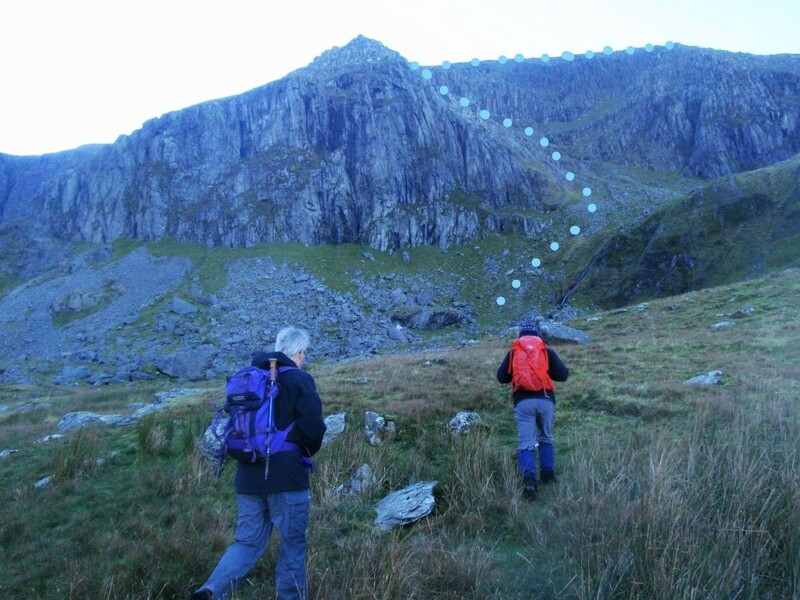 These discussions resulted in SMC and the MAM joining forces for a joint meet to the fabulous MAM Hut Glan Dena, situated in the Ogwen Valley, from 16th – 18th November 2018. The trip was well attended with a total of twenty plus participants arriving at the hut throughout Friday and Saturday too. Adrian A., who is a member of both SMC and MAM, very kindly sponsored the meet. Unfortunately Adrian’s weekend became something of an ordeal due to ‘camper van’ trouble. His van broke down whilst travelling to Wales on Friday evening, though Adrian finally made it on Saturday afternoon with a home-made fish pie in tow! On Saturday it was rather a cloudy and damp start to the day but Snowdon beckoned for some. Ash made an early start to climb the iconic mountain along the Miners Path. 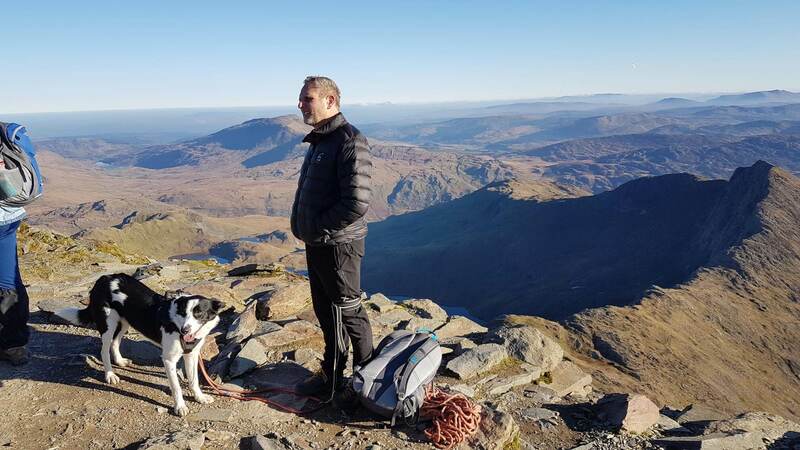 A team of four including Tony H, Andrew S, Ilya and Tim along with Tony’s dog Jasper, ascended Snowdon via Crib Goch. It transpires that Jasper is a perfect scrambling companion and climbed the route with no trouble at all!! MAM member Stuart W. decided to avoid the hustle and bustle of Snowdon and instead went out on a lovely mountain walk. Scrambling was definitely the order of the day for many others too. Four MAM members, who also belong to the Worcester Climbing Club, Ian, John, Dawn and Dave went into Cwm Llafar from Bethesda and walked up to do the Llech Ddu grade 1 scramble. To find out about their adventures, as recounted by Ian, please click here. Pete and Clare headed over to Capel Curig, climbing Moel Siabod along the South East Ridge (grade 1 scramble). It was a misty and murky start but soon the clouds lifted and the beautiful surrounding landscape was revealed. It was pretty blustery at the summit and the walk along the ridge certainly blew away the cobwebs but the views were fabulous. It was a great scramble and both Pete and Clare enjoyed the day immensely. With Jo D. now intent on bagging the top 100 Welsh Summits, she along with Mike R. and Scott J. had devised a route that would bag two of them in one day! They headed out along the lane past the Ogwen hostel and up steep grassy, cloudy slopes to find Needle’s Eye Arête (Grade 3* scramble). As Jo observed it was ‘rather damp in places but a really interesting route with some good technical sections needing a rope.’ Once at the top, the trio headed north to bag two of the top 100 Welsh summits Foel Goch (831m) and Carnedd y Filiast (821m) – remote tops away from the main summits and crowds with great views out to Bangor. They then returned to descend via Y Garn’s north-eastern shoulder. So, all in all, quite a journey! On the evening everyone gathered for a communal meal in the spacious and very well equipped Glan Dena kitchen. Prior to the meet Adrian had asked everyone to bring a contribution and this turned out to be a veritable feast. All the food was delicious with plenty of seconds for everyone. Plus it gave us all the opportunity to exchange stories of the day’s adventures and generally get to know each other a bit better. Sponsor of the meet Adrian, suggested we should be making this joint venture an annual event and there was certainly much enthusiasm for this idea. A good range of activities took place on Sunday too. Tony, Mike, Scott, Ilya and Tim took on one of the scrambles at Triffen. 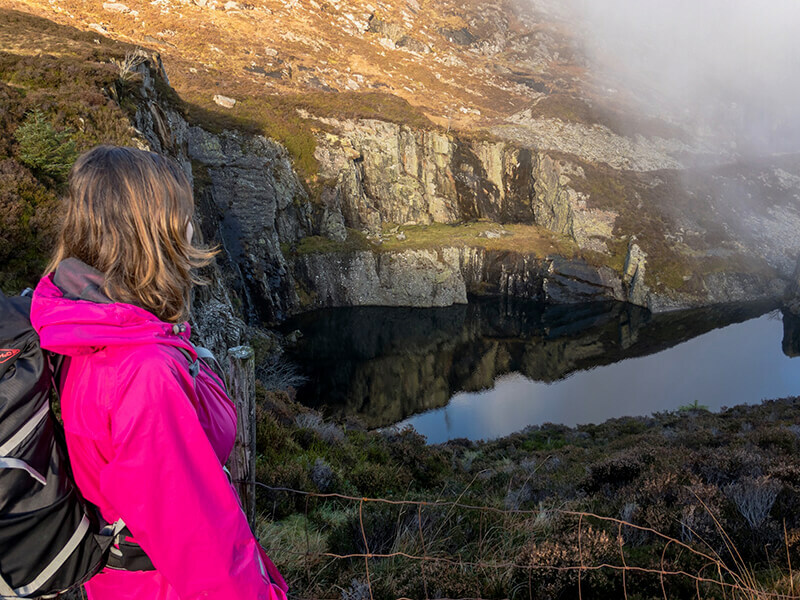 The Worcester crew opted for a day of walking around Vivian Quarry in Llanberis. To find out more please click here. 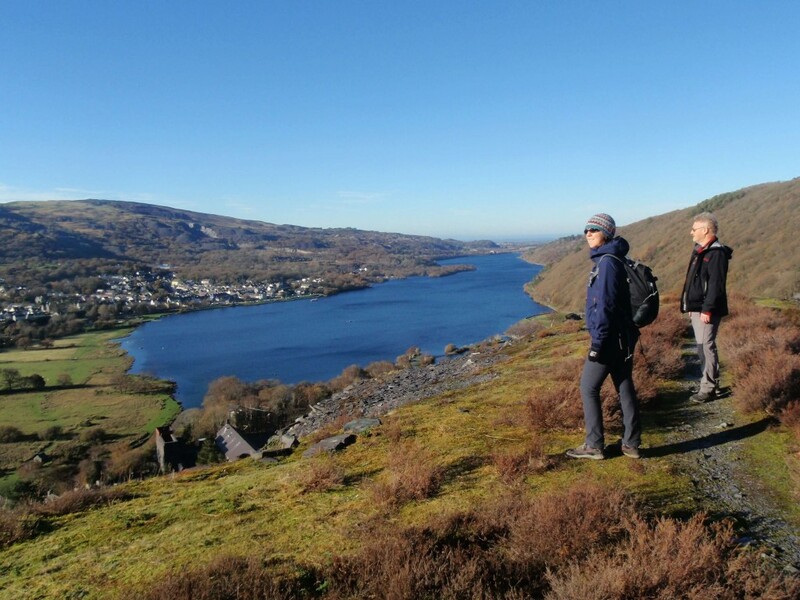 The photo below shows the superb views they enjoyed over Lyn Padarn and the Snowden massif and the fabulous weather too! So all in all it was a fabulous weekend with new friends made. An annual MAM/SMC joint meet would be a great addition to our busy meets calendar. The communal meal was a great success and is certainly something we should think of repeating at other meets. One lasting mystery of the weekend remains… We never got to meet the new SMC member who drove all the way over on Saturday and then left due to a work call-out. Prior to departing he did deposit a tray of cup cakes and a short note. Similar to the ‘Milk Tray Man’ from ‘back in the day’ his identity may never be known but rest assured the cakes got eaten with gusto! Thank-you ‘Cup Cake Man’! To find out more about what the Worcester Climbing Club Crew got up to at this meet please click here.